Early cinema's most prolific star, Annabelle Whitford was the daughter of a Chicago telegraph employee. Her parents separated and she began dancing, apparently around the age of 13, for Moore's Comic Opera company as Beauty in Beauty and the Beast. William S. Moore was her manager, ahd she took on his surname after her father died. A follower of Loïe Fuller, she performed in the 'Grotto' at Chicago's World Fair in 1893, giving her Serpentine, Butterfly and Sun dances that would soon feature in her films. She was 16 when was first filmed for Edison in 1894, and made several films for Edison and Biograph between 1894 and 1897, billed as Annabelle. She performed several dances at the Black Maria studio and was featured in the Kinetoscope's first London showing in October 1894. 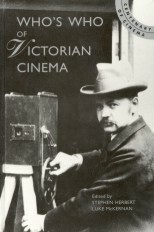 The Serpentine Dance, Butterfly Dance and Sun Dance were often hand-coloured and enjoyed such popularity that they frequently wore out, necessitating many reprintings and several refilmings . 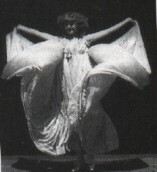 When the Biograph was launched in 1896 two of its earliest productions were Annabelle's Butterfly Dance and a Flag Dance in which she performed draped in the American colours. The sale of her films was further boosted in December 1896 when it was revealed that she had been approached to appear naked at a private dinner party at Sherry's Restaurant, New York. Annabelle remained the centre of public attention throughout the 1890s and 1900s, starring as the Gibson Bathing Girl in the first of Ziegfeld's Follies in 1907. She continued to appear in the Follies until 1912 when she married Edward James Buchan and retired from the stage, helped by a generous inheritance from her Whitford grandfather.